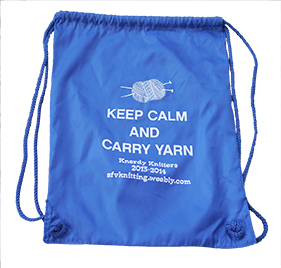 Become a Knerdy Knitter today! Become a member of the Knerdy Knitters of the San Fernando Valley and you'll never miss a moment of fiber fun. A full 12 months of membership and all its benefits. A complimentary gift (see below for some examples of our past member gifts). A subscription to the guild's monthly newsletter, The Swift, which profile's area yarn shops, highlights cool tools and keeps you up-to-date on guild activities and projects. Discounts on events such as workshops or special offerings at local yarn shops. Invitations to the guild's monthly meeting, TGIFiber, Yarn Club and Saturday Stitchers. Invitations to the guild's annual WIP (works-in-progress) and Chains and Stash Exchange and holiday party. A vote in our elections, policy decisions, event schedule, and more. Opportunities to volunteer, offer classes, and share your love of fiber arts with Los Angeles! Best of all, you'll be promoting and supporting the craft and practice of knitting, crocheting and other fiber arts in the San Fernando Valley. People of all experience levels, ages and fiber persuasions are welcome. To join you can come to one of our meetings and give a check to one of the officers present or use the PayPal button below.